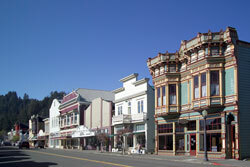 Ferndale, California, is a small town (pop: 1370) full of well preserved Victorian and Craftsman architecture. 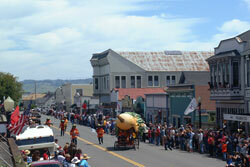 Its commercial Main Steet is lined with ornately decorated shops built in the 1800s from the native redwood forests. Ferndale's architecture is so unique, the entire town is listed as California Historical Landmark #883, Main Street is Historical District listed in the National Register of Historic Places, and twice the town as been honored as one of America's Prettiest Painted Places. As you approach Ferndale from Highway 101, you will cross the Eel River on the historic and beloved Fernbridge, which at the time it was constructed in 1911 was the largest concrete bridge ever built. The Eel River provides opportunities for fishing, wildlife viewing, horseback riding, kayaking, and ATV and off-road use. Ferndale is close to the ocean, with Centerville beach and several hiking trails to other beaches only minutes away. The scenic drive along the Lost Coast will take you through the towns of Petrolia, the site of the first oil well drilled in California, as well as Honeydew, and Cape Mendocino, the westernmost point of California. Ferndale loves a parade beginning with the Cinco de Mayo parade. Mid May is a parade for the Portuguese Holy Ghost Festival, and Memorial Day starts with a parade featuring a military band, honor guard, VFW, and anyone caring to join in. After the parade a service is held in the town cemetery honoring out nation's war veterans. In the afternoon the Kinetic Sculpture Race rolls into town. Then comes the Pet Parade in June. On the 4th of July we start with fire truck rides for the kids, a parade down Main Street, followed by a barbeque and in the evening fireworks at the fairgrounds. There's also a Homecoming parade in October, and we finish the year with the Lighted Tractor Parade just before Christmas. There is always something interesting going on in Ferndale! Between parades, attend live theater, visit local restaurants, see dance recitals, go to the Humboldt County Fair; stray to Eureka for Arts Alive and dinner. Visit the farmer's markets, buy local produce, grass fed beef and lamb, and superb local bread and desserts. Your hosts will provide you with all the information on their list of fun local activities. Ferndale Farms - Grass fed lamb. Ferndale is also a great base for exploring the many state and national forests and other attractions in Humboldt County.